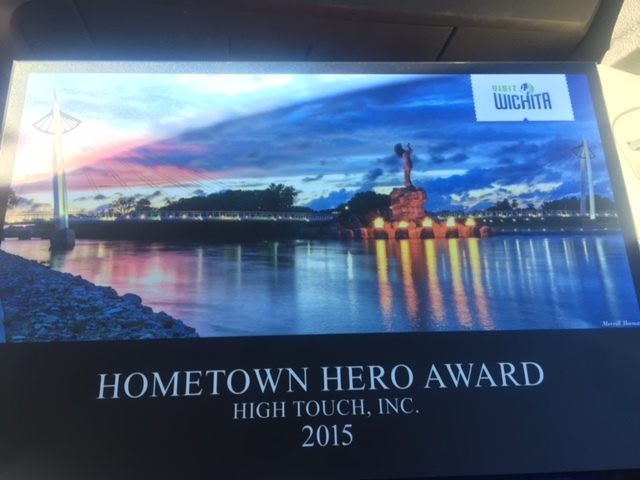 On Thursday, January 28, Visit Wichita awarded High Touch Technologies the Hometown Hero Award for the Special Olympics National Softball Tournament last summer. CEO Wayne Chambers and Human Resources Recruiting Manager Jennifer Hughes were present to accept the award during Visit Wichita’s annual meeting. The Hometown Hero award was created to thank a local organization that has made significant efforts to bring a meeting, event or convention and its substantial economic impact to Wichita. “Thanks to their dedication to Special Olympics, they came to us with the idea to bring the Special Olympics National Softball Tournament to Wichita. As a result of their partnership with Visit Wichita and the Sports Commission to create a winning bid proposal for the event, more than 600 athletes with coaches and family members came to Wichita in September and celebrated their national tournament. Next PostWichita Eagle : "Visit Wichita honors six for 2015 efforts"